Here's an idea Toby came up with by himself. 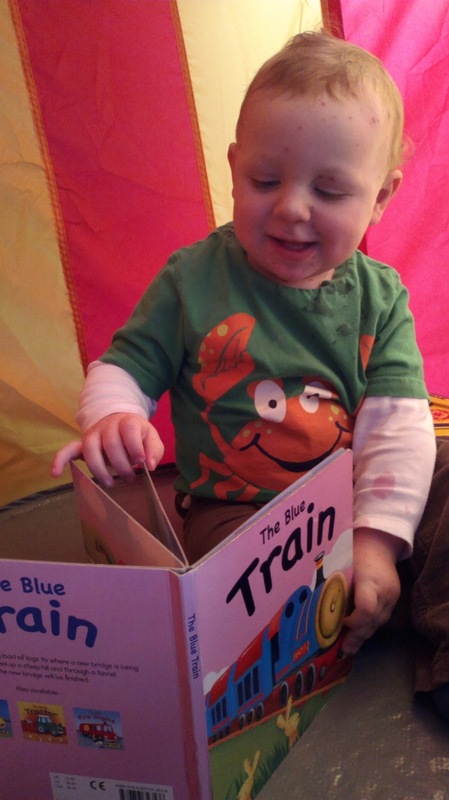 He likes to spend ten minutes pootling about gathering up books and depositing them in the play tent. He'll then retire to his 'library' for quite long stretches, looking at his books and playing with a toy he's picked out to take in with him. Everyone with kids knows they like small, private spaces and hidey holes. Ollie's favourite used to be a cupboard in the dresser, until I had to take the doors off because he kept slamming them and giving the fish in the tank above palpitations. This is now the third incarnation of the play tent, through general wear and tear (Ollie is 'wear' and Toby is 'Tear'). To Ollie the tent is the cabin on a boat into which he dives if it starts to rain, or there's a crocodile, or a naughty dinosaur. To Toby it is a place to pile cushion and roll around, or relax with a good book, preferably about trains or tractors.